Birthmark Removal - What Type Do You Have and Can It Be Removed? There are many different types of birthmarks, and treatment varies based on the birthmark type, its size and location. However, birthmarks are generally considered harmless and some disappear or shrink without intervention. The two main types of birthmarks are vascular and pigmented. Vascular birthmarks consist of enlarged blood vessels, and pigmented birthmarks are caused by an overgrowth of the skin cells that create pigments. Hemangiomas result from an abnormal buildup of blood vessels in the skin or internal organs. About 30 percent of the time they are present at birth, and the rest appear in the first few months of life. There are several types of hemangiomas, most of which appear on the face or neck. Hemangiomas in the skin's upper layers are called capillary or superficial hemangiomas, while those that are deeper in the skin are called cavernous or deep hemangiomas. Some are mixtures of both types. Hemangiomas are red or reddish purple in color and appear raised. They tend to grow very rapidly, and continue growing for up to one year. In some rare cases, they can interfere with breathing, feeding or other bodily functions. Hemangioma Rx: Superficial "strawberry" hemangiomas are often treated to prevent growth and hasten their disappearance, particularly when on the face. Hemangiomas can also appear on the eyelid and block vision. These may be treated with steroids or lasers. Some doctors are using the blood pressure drug propranolol off-label to treat hemangiomas in infants. This drug has been shown to inhibit the growth of hemangiomas in clinical trials. Port wine stains are another common type of vascular birthmark. These occur in about three out of every 1,000 infants, and appear at birth. They can be flat, pink, red or purplish, and are often seen on the face, neck, arms or legs. Port wine stains do not go away by themselves. In addition, these vascular birthmarks thicken in two-thirds of individuals, which increases the risk of bleeding. Port Wine Stain Rx: Treatment is based on the severity of the port wine stain. It can include camouflage make-up or laser removal. The type of laser used is based on the characteristics of the port wine stain and other personal factors. Multiple treatments are always needed. Intense pulsed light can sometimes be used to treat port wine stains, but it is not considered the treatment of choice. Macular (flat) Stains are called "angel's kisses" when they are on the forehead, eyelids, tip of nose or upper lip. When they are found on the back of the neck, they are called "stork bites." In general, these birthmarks are faint, mild red or pink, and flat. Macular (flat) Stains Rx: No treatment necessary. Cafe au lait spots are flat tan or brown patches that can appear anywhere on the body. Cafe au lait spot Rx: Laser treatment. Mongolian spots are flat, bluish-gray patches that tend to occur on the lower back or buttocks. They are more common among people with dark skin, and typically fade with age. Mongolian Spot Rx: These usually disappear spontaneously by age four. Congenital nevi are moles that are present at birth. They are permanent and vary in size. The most significant risk of congenital nevi becoming malignant occurs when it is greater than 20 square centimeters. Congenital Nevi Rx: Monitor moles regularly for changes suggestive of skin cancer. Visit our article on how to spot skin cancer for more information on melanoma. Removal may be necessary. There is no one-size-fits-all treatment recommendation for any birthmark; treatment is as individual as the birthmark itself. The first step is a consultation with a pediatrician or board-certified facial plastic surgeon for proper diagnosis of the birthmark. He or she will also discuss treatment options with you based on the diagnosis. Choosing a facial plastic surgeon can be difficult due to the large number of practitioners offering their services. You may wonder who you can really trust to give you the sensitive care and excellent results you deserve. To help you make your decision, All About Facial Rejuvenation has assembled a directory of facial plastic surgeons with superb skills, years of experience and impeccable reputations as compassionate, ethical medical professionals. Laser birthmark removal can cost anywhere from several hundred dollars to more than a thousand dollars per session depending on the surface area being treated, type of laser device and other factors. Financing plans may be available to help cover the cost of laser birthmark removal. The cost of treating vascular birthmarks may be covered by your insurance provider. Find out what your insurer will or will not cover before agreeing to treatment if cost is an issue. The cost of camouflage make-up to cover up birthmarks varies by product line. Roy G. Geronemus, MD, is the director of the Laser & Skin Surgery Center of New York. He graduated from Harvard University and received his medical degree at the University of Miami School of Medicine. Dr. Geronemus completed his residency in dermatology at the New York University (NYU) Medical Center, where he served as chief resident his final year. He completed a fellowship in Mohs micrographic surgery and cutaneous oncology at NYU. Dr. Geronemus is a Clinical Professor of Dermatology at New York University Medical Center where he founded the laser program and served nine years as the Chief of Dermatologic and Laser Surgery. He is also the director of the Skin/Laser Division in the Department of Plastic Surgery at the New York Eye & Ear Infirmary in New York City. 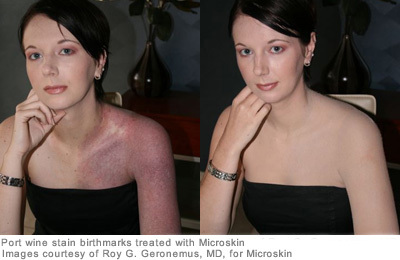 Microskin — a simulated second skin that is matched to your skin color and then airbrushed or sponged on — can be used as a standalone treatment or in combination with laser therapy to mask birthmarks, including port wine stains. Most camouflage make-ups are clumpy and rub off on clothing or napkins soon after application. Not Microskin. This waterproof cover-up product was developed in Australia, where it was able to withstand intense heat and humidity. While Microskin has not been approved as a sunscreen, it does work well in that capacity. Microskin can last for up to two days after application on the face. Microskin cost varies based on the size of the area to be covered up. Payment plans are available. 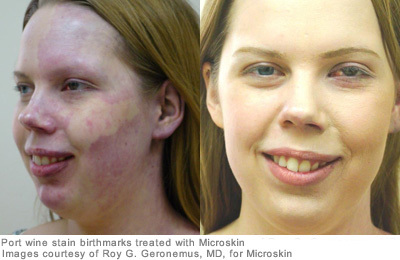 The first New York City-based Microskin clinic opened in 2010.